Sea Stars Continue Die Off – Neptune 911! Then he finds what he’s looking for – a mottled gray star that even at full-size fits in the palm of his hand. It has whitish lines down it’s arms — one of the early signs of wasting. 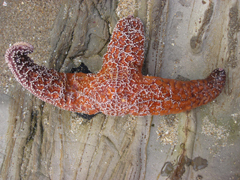 The symptoms vary depending on the species of starfish, but Raimondi says it usually starts with lesions. Melissa Miner finds a pisaster ochraceous, or ochre star, that looks even sicker. Two of its five purple arms look ghostly white, like they’ve been dipped in candle wax. Nearby, at the Sitka Sound Science Center, aquarium manager Taylor White recently discovered that starfish in their touch tanks were losing limbs. The aquarium has an open-water system, so what’s happening in the tanks is a good indicator of what’s happening in the marine waters nearby. “Right now we have no explanation that is consistent with the pattern that we’ve been seeing,” Raimondi says. In recent months, temperatures throughout the Pacific have been unusually warm. In August global sea surface temperatures reached record levels — the average temperature was 1.17 degrees Fahrenheit higher than the 20th century average.